Congratulations you’re getting married. Before the big event you’ll want a memorable Amsterdam hen weekend with your girls. Planning a bachelorette party with a cool bunch of friends’ creates a happy time bonding together without the guys. Basically, the best kept secret to starting off a good married life is to celebrate the last days of your single life in style. It will help you cope better with your last-minute wedding plans. And the best news is, by incorporating a fun session with the ladies in Amsterdam creates memories that will last a lifetime. Moreover, the connection between you and your girlfriends grows stronger. Additionally, a quick burst of extra endorphin’s and feel-good energy before your wedding helps you forget about the stressful to-do-lists. You’ll feel fresh and empowered to consult with your wedding vendors, celebrant and suppliers. Better still, you’ll be ready to tackle any unexpected last assignments. So, here is is your guide to a fun hen weekend. 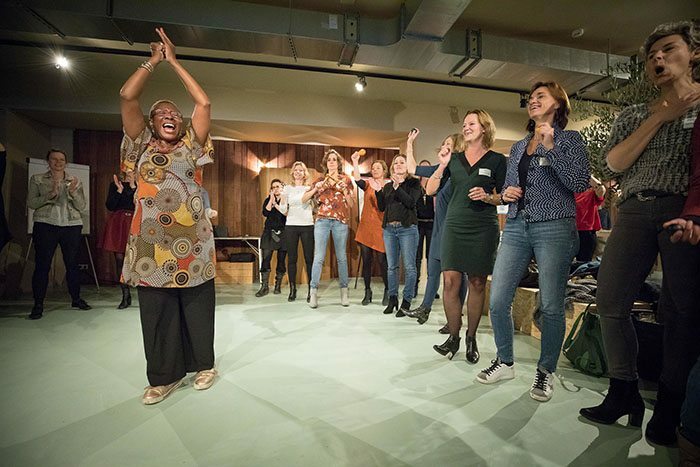 The perfect hen do in Amsterdam is a gospel workshop a la sister act. It will transform your afternoon and give you energy before heading out for an evening of fun. Most importantly, the easy session will bond you and your friends, creating more meaningful memories. It’s also an excellent, enjoyable event to catch up with everyone. Essentially, you’ll enjoy your quality time together. During a playful gospel workshop a la sister act you’ll sing, dance and laugh together while learning gospel mannerisms, moves and sounds. Experience your own groove, delight and be astounded by your voice and natural sense of timing. Basically, there are no complicated techniques, singing or dance steps involved. Go at your own pace! We will use call and response, and your participation. Don’t think, turn-off, relax and allow your body plus authentic voice to work together, naturally. Send me an e-mail for more details about your Amsterdam weekend hen night out with your cool bunch of friends.